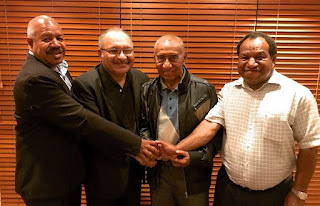 Our coalition of Parties and Independent Members of Parliament have agreed to support a PNC-led Government form the Tenth Parliament of Papua New Guinea. Following the 2017 National General Election, PNC has recorded the highest number of Members-elect, and is on-track to have the highest number of Members in this Parliament. In accordance with National Electoral Laws, PNC is now anticipated to be called upon by His Excellency, the Governor-General, to form Government. A PNC-led Government has had the opportunity to manage the affairs of the Nation for the past five years. Through a most challenging time in the global economy, and through one of the worst droughts in history, the PNC-led Government has insulated our economy and our communities from these shocks. During the past five years, the Government has delivered unprecedented growth through the delivery of clear and targeted policies. There have been programs and policies that could have been run with greater efficiency, and lessons have been learnt. The new Government will increase its capability to meet the expectations of our people. These policies have enabled an additional one million children to obtain an education, and have expanded access to healthcare for those who previously could not afford to see a doctor. The infrastructure of our nation has expanded dramatically in all regions of the country. Over the past five years the Government has also empowered provinces and districts to have their say and to guide resource allocation for local service delivery and infrastructure development. Through more autonomous arrangements, we will continue to facilitate this devolution of authority and decision-making to enable people in our regions to have much greater say in the governance of their communities. The reforms of the past five years have laid the foundations for a strong Government with a powerful policy agenda to lead the Nation in the next five years. In the past five years, this Government has delivered significant national events, and now as we prepare to host world leaders at the APEC Summit, we must have a capable and experienced Government leading this process. Drawing on the experience of the past five years, our Government in the next Parliament, will work as a group to manage all challenges that we face. We will further work together to expand the delivery of services and infrastructure development to our remote and rural areas in all regions of Papua New Guinea. Our Government will work with industry to increase investment and to diversify our economic base to strengthen the sectors that are at the heart of our economic future, including tourism, fisheries and agriculture, and the downstream processing of our minerals. We will continue to empower our people through strong and dedicated Christian and State partnerships, and programs in education and healthcare. Working as a cohesive team, we the Government Coalition, will take our great Nation to the next level of economic and community development by delivering stable policy that is relevant to the people of our nation.